Well researched and stated, Jeff! IF Biltz's theory has some prophetic merit, and you certainly make a great case that it's tied to major events related to the Jews, then we know Ezekiel 38-39's Gog-Magog Battle is on the horizon, or it could correspond to the Abomination of Desolation at the mid-point of the Tribulation. Since the Church is not destined to live through the Tirbulation, either scenario shows the Rapture could occur much sooner than later. Thanks for that encouraging reminder! Thanks for the feedback, Nathan. Yes, I'm thinking the same thing: either of those two events seem likely. We'll have to wait and see, but certainly we should be very, very watchful--just as the Lord commanded us to be! We live in very interesting times. 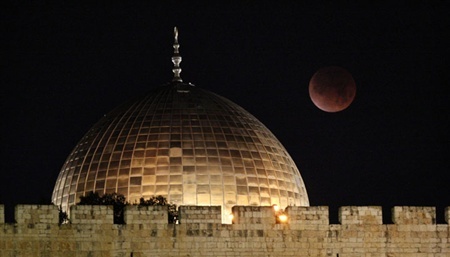 So the point is, if the blood red moons and darkening of the sun are SIGNS for the Day of the Lord, since the rapture is a back to back event with that Day, then these signs CERTAINLY pertain to us also. My guess is, that we will be snatched away just BEFORE these signs occur. Lyle, I appreciate your comment. I didn't quickly dismiss anything, as it would be exciting to find something we can definitively point to in scripture to match up with the 2015 eclipses. As I pointed out in the article, the "day of the Lord" that Joel was referring to was about Pentecost. Recall Peter quoted Joel--and there were signs in the heavens at that time (The Star of Bethlehem talks about that event too). I agree, the Rapture could happen before any of those events in 2015. Now that, my friend, is exciting! Maranatha! Jeff, thanks for writing the above-mentioned article. Well done, m'Brother! My understanding from my Hebrew-Christian author friend (now in the Bosom of Abraham and of Our Father) is that, actually, the Feast of Trumpets is 2 days long, and the trumpets are blown twice. THAT may well be what is meant by "not knowing the day nor the hour." Anyway, I like that explanation. It still leaves one in Great Anticipation of The Lord's Taking Us Away with Him, and for His Return! Most of the "watch" passages are in the Olivet Discourse (Matthew 24:42, 44 and 25:13)...which Thomas Ice and other dispensational teachers point out is for Israel, not for "us" the Church. The time for watching will start with the "abomination that causes desolation" mentioned in Matthew 24:15 and Jesus refers back to Daniel 9:27. Daniel 12:11 says from this event the Hebrews believers can count from 1,290 days...and Revelation 12:6 says 1,260 days. So between this 30 day period the believers can expect the Lord to return. This sign and others...are for Jews. My Sunday School teacher Gene Visher points out that the Church is to be looking (Philippians 3:20, Titus 2:13, Hebrews 9:28), abiding (1 John 2:28), watching (1 Thessalonians 5:6) and waiting (Romans 8:28, 1 Corinthians 1:7, 1 Thessalonians 1:10, 2 Thessalonians 3:5). These are not commands since they are in the passive and not in the imperitive. This means our focus is on ministry and service while we are looking, watching, abiding, and waiting for our blessed hope, the appearing of Jesus in the clouds to call up His bride. "No one knows about that day or hour, not even the angels in heaven"
I believe if you look closer at these passages, you may see they are referring to the Second Coming, not the beginning of tribulation. This is supported by I Thess 5:4. We are not in darkness as to when that thief (the tribulation) will arrive. So while we can't know the exact "day or hour" (old Jewish idiom) of the Second Coming, we can for certain know when the thief arrives, of course by studying our Bibles (the light that exposes the thief).